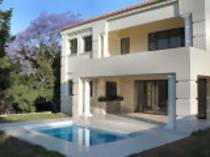 Ninety North guest house offers accommodation in two modern villas in the northern garden suburb of Ferndale Johannesburg. Ninety North Guesthoude prides itself in lproviding accommodation that is comfortable, relaxed, cared for and spoiled in our luxuriously large bedrooms and modern living areas entirely dedicated to guests. Experience warm South African hospitality in a typical upmarket home environment. In 2003, the land was subdivided and the end of 2005 saw the first villa completed, with the second villa completed soon after. NINETY NORTH GUESTHOUSE is set as a typical upmarket South African home environment to give their guests a relaxing and memorable stay. The garden, living/dining room and splash pool off the covered patio are there for your enjoyment in this quiet residential suburb that is so close to the hub of business, shops and entertainment. Enjoy a sumptuous breakfast on the patio overlooking the garden. Kick your shoes off, put your feet up and enjoy a DVD, or catch up with latest news on Satellite TV. Cool off with an afternoon swim. Wireless internet access is available throughout both guest houses. * En suite marble bathroom with double vanity, shower and bath. * En suite bathroom with double vanity and shower. * En suite bathroom with double vanity, shower and bath. * En suite marble bathroom with double vanity and shower. At Ninety North Guest House we serve a sumptuous breakfast to start your day after a good night's rest in your spacious and comfortable bedroom with private en suite bathroom. In between, enjoy your garden and pool whilst there is a lounge to relax in and tea and coffee is available all day.